How much does it cost to travel to Brasilia? How much money will you need in Brasilia? R$225 ($57) is the average daily price for traveling in Brasilia. The average price of food for one day is R$79 ($20). The average price of a hotel for a couple is R$168 ($43). Additional pricing is in the table below. These average travel prices have been collected from other travelers to help you plan your own travel budget. The capital city of Brazil, Brasilia is a uniquely-planned city that was constructed in four years from 1956-1960 in the shape of a large bird or airplane. Renowned for its modern architecture, the city listed as a World Heritage Site by UNESCO and attracts architecture aficionados worldwide. 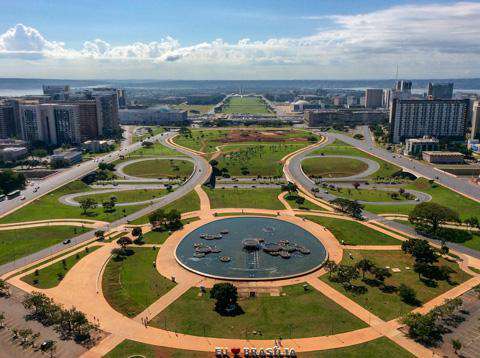 For more information about this, check out this guide to architecture in Brasilia. The Monumental Axis is the central avenue of the city and is the site of many important government buildings, monuments, and memorials. At the eastern end of the Axis is what is known as the Three Powers Square (or Praça dos Tres Poderes), where the country's three highest authorities are located-the Congress, the Presidential Palace (called Palacio do Planalto), and the Supreme Court. Other attractions lining this central avenue are the Television Tower right in the middle of the Axis, the Juscelino Kubitschek Memorial and museum on the western part of the Axis, and the modern Cathedral of Brasilia designed by Brazilian architect Oscar Niemeyer in 1970. The President's official residence Palacio da Alvorada (Palace of Dawn) is located on Paranoa Lake, though it is not open to visitors. Brasilia is also a hub for art and entertainment. Its main theatre, the National Theater Claudio Santoro, features three main halls for plays and concerts, art galleries, and temporary art exhibitions. There are also many public works of art around the city featured in architecture, landscape designs, and sculptures by many famous Brazilian artists. Another center for the arts is the Centro Cultural Banco do Brasil, which houses contemporary art galleries, a cinema, and a cafe. CLS/CLN (or SCLS/SCLN) - Local commerce sectors (Comercio Local) along the wings. The arched "wings" of the city are mainly residential zones, with several rows of medium-rise apartment blocks and several small commercial districts. The intersection is the commercial and cultural hub, with stores, hotels, museums, and the Cathedral of Brasilia. The "nose" of the city faces Paranoa Lake. Visitors can spend days in Brasilia admiring the treasure trove of modern architecture-each unique building designed by world-renowned architects, and each housing important government facilities, cultural venues, art, and more. For something a little different, go lakeside at Paranoa Lake and watch the sunset over the city, or visit Brasilia National Park which offers an array of indigenous plant and bird species as well as a natural swimming hole. Cuisine of Brazil varies greatly by region, usually a mix of indigenous, European, and African influences. As the capital city of Brazil, Brasilia has a full range of flavors from traditional dishes to international fare. Brasilia itself does not have a typical, regional cuisine; however, restaurants do serve food from many Brazilian states. Rice and beans are central to traditional Brazilian cooking, as are root vegetables like cassava and yams, as well as fruits including acai, cupuaçu, mango, papaya, guava, orange, passion fruit, and pineapple. Brazilian feijoada is considered to be the national dish, a kind of black bean and meat stew typically served with rice and oranges. It is occasionally topped with vegetables such as cabbage, kale, potatoes, carrots, okra, pumpkin, chayote, and sometimes banana. The national beverage is coffee. Another popular tradition in Brazil are salgadinhos, or small savory snacks similar to Spanish tapas. Some of the more popular small bites include a kind of cheese bread called pao de queijo, a chicken croquette called coxinha, and a Lebanese-inspired snack called kibe/quibe made from cracked wheat, minced onions, and finely ground meat that can be served baked, fried, or raw. As a national air travel hub, Brasilia is host to flights to and from many destinations. The primary airport serving the city is Presidente Juscelino Kubitschek International Airport, located about 11 kilometers from the city center. Most flights are domestic, however several non-stop international flights operate to and from Orlando, Buenos Aires, Paris, Lisbon, Lima, Bogota, Miami, Panama City, Montevideo, Santa Cruz, Bolivia, Atlanta, Punta Cana, and seasonal to Santiago and Aruba. The city can be reached from the airport by bus or taxi. Brasilia is also well-connected by bus to the rest of Brazil. Travel times are about 15 hours from São Paulo, 18 hours from Rio, 10 hours from Belo Horizonte, and 3 hours from Goiania.